Can you believe that Crocktober is almost at an end? This has truly been one of the most fun months I have had with you all since I started The Kitchen Wife! 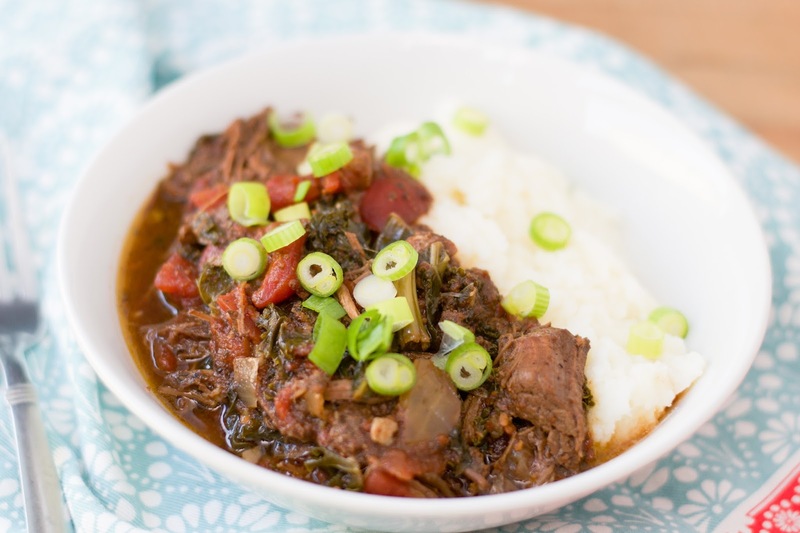 When I think of crockpot meals I feel like the king is the Pot Roast. So for today's Crocktober recipe we are taking that roast and amping up the flavor Italian style! To kick things off I HIGHLY recommend that you line your crockpot with the Reynolds Kitchens Slow Cooker Liners. They have been a clean up game changer for me, and I love them. Next place your chuck roast into the bottom of the crockpot. Little tip, if you have extra time I encourage you to sear your roast on each side. It really does add LOADS of flavor. However, I did this without to show you that you can just chuck the roast in there are it will still be AMAZING! I know you are thinking that a tablespoon is a lot of salt, but remember this is a THREE POUND roast. That is a lot of meat that has to be permeated. After that add the pepper. Next add the diced onions. After that add the Italian herbs. Top with the diced tomatoes. Then pour the balsamic vinegar over everything. Place the kale on the top of everything. Then cover and cook on LOW for 8-10 hours. Once the roast is fully cooked, remove the meat from the crockpot and shred. Look at how amazing that looks! Return the meat back to the juices and you are ready to serve! 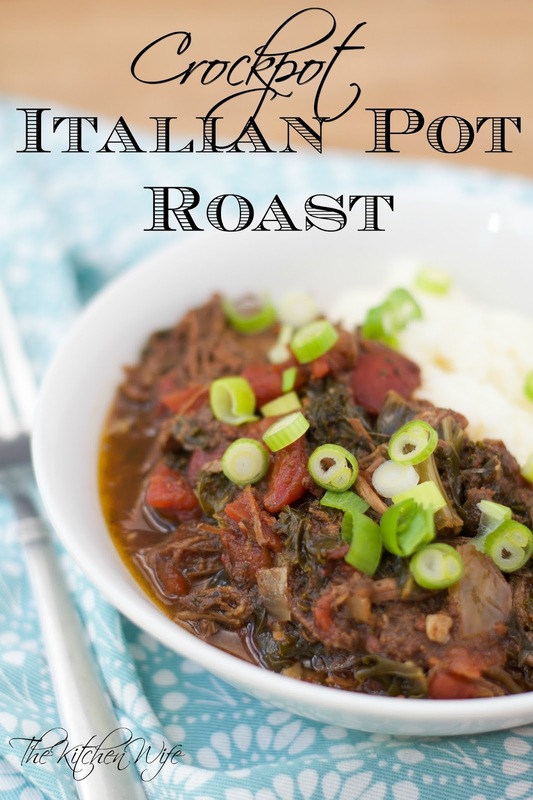 I love to serve this Crockpot Italian Pot Roast in a bowl over mashed potatoes or cheesy polenta. It is PERFECT for these cold rainy days we have been having here in West Virginia, and the winter months to come. I know you and your family are going to love this recipe, so get in the kitchen and give it a try TONIGHT! Place the roast in the bottom of the crockpot. Top the roast with the onion, garlic, parmesan cheese, and Italian herbs. Top everything with the tomatoes and pour the balsamic over everything. Place the kale on top of everything. Remove the meat from the crock pot and shred. Return the meat to the crock pot.